This OOTD is actually from last Friday. We had dinner reservations with friends at 6pm and I knew I wouldn't have much time between work and getting home before heading over to the restaurant. So I wore to work the outfit I wanted to wear out... my new Whispering Vespers sweater. I love love love this look!! Sorry about more snow...stay warm!! I am in love with how simple and chic this look is! The sweater is absolutely darling! Hi Mrs. Strawberryswing! I'm in Northern VA so I definitely understand your frustration with mother nature and all her frozen glory. I absolutely love those Miz Mooz boots. Right now it appears they are sold out at Nordstrom. Do you think they'll be coming back? I'd really love to get a pair finally. Angel-Lyn - I dont know if Nordstrom will be getting more... Endless.com (linked above) has them in 4 different colors, of course they only have brown in size 10, but the bordeaux, black, and grey are available in all sizes - also, go a 1/2 size down from your usual! GL! Great outfit! I have those same boots in brown and black and wear them constantly. I also love your St. Patrick's paper pennants, too cute! 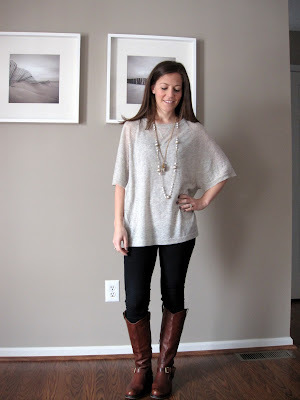 I think this outfit is so perfect for the snowy weather! We are also getting ice tonight and I am dreading it! Natasha - Definitely, I spend my nights (and snow days) normally in sweats, I like to put a little effort in the days I do have things planned, nothing like other bloggers to inspire! Elizabeth - Thats great that you have the boots in two colors, they were great bang for the buck. Thanks about the pennant! Rosa - Thanks lady! and yeah, I'd rather get another 12"+ of snow then all this ice they are talking about..
You look so great E! Andi - aww, thanks lady! You are missed! Gigi - Thanks! and thank you for checking in, I'm doing better. I hope you are doing well too!